Mauritius Telecom/Orange Takes 16 Days to Repair Their Crap. 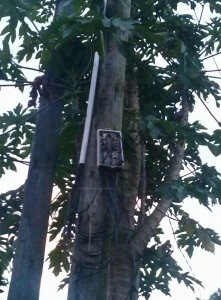 The connection box of Mauritius Telecom on the column doesn’t has a cover. My Internet connection was very choppy. I registered a complaint on 3rd this month. After 2 days, i lose my phone dial tone completely. A technician came and diagnosed the column. They found the wires to be of very bad state. They said another team should come and replace the whole connection box. But the team never came. I kept calling the customer care and they said there was some underground fault which will take time to fix. They put another complaint for me. Then another technician came, saw the lines were not placed correctly in the column. Fixed it. Can’t believe it took them so much time to fix this. And guess what? The box on the column stayed as it is. I don’t think they will replace it soon. Anyways, we’re stuck with Orange for Internet. Emtel is not interested in targeting the mass. They are more interested in providing for corporate users. Meanwhile, Bharat Telecom proved to be liars with their Rs 280 for 10mbps promise. Mauritius Telecom is taking the maximum juice out of people as much as it can. That’s really appalling! It’s really frustrating to see how they can do just about anything and get away with it. It’s only in Mauritius that the customer is not king. Don’t hold your breath for the compensation btw! They don’t have to treat us like kings because most of us are chained to Mauritius Telecom. There is virtually no competition among ISPs. We don’t have affordable alternatives. They told me they would contact me on the phone to provide the compensation. Still they haven’t contacted. I will continue to annoy them meanwhile. NOTRE LINE DE TELEPHONE NE MARCHE PAS PENDANT 2 JOURS. SI VOUS POUVEZ FAIRE RESOUDRER LE PROBLEM UN PEU PLUS VITE. WILL I PAY THE RENTAL SERVICE FOR THESE DAYS? NextWhen will UoM Cafetarias be of Proper Hygienic Level?